Hi lovelies! I hope you all had an amazing weekend, mine included quesadillas and footsie pajamas, so it ended up being a bit more relaxing than I initially anticipated. I've been trying to fight off disease all winter with immense amounts of vitamin c, but I think it may have finally caught up with me. I wore this out to dinner with my former roommates a couple of weeks ago. Boots and a blazer are my favorite pieces to polish up an outfit in an instant. The clutch is from Etsy, I originally saw it over on Coffee Beans and Bobby Pins and knew it had to be mine. I'm in LOVE with that clutch...so fun! 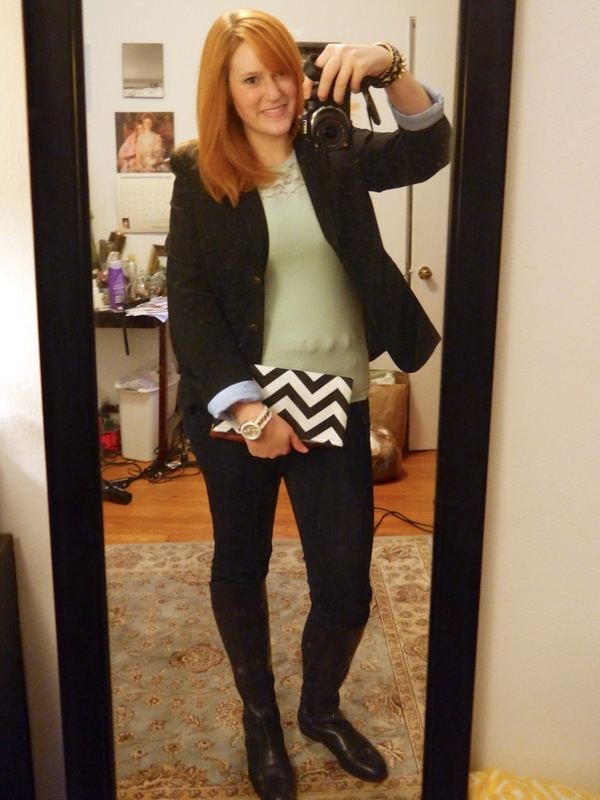 I love the chevron clutch! What an adorable staple for your wardrobe! Super cute outfit. Sorry you weren't feeling well this weekend, hope you are able to be back to full capacity soon! LOVE the clutch! I think I need to have it too! Great outfit. I love the boots and the clutch. That clutch is super cute! I love it. Love the clutch! Can't believe it's from etsy!